I don’t do well with summer. Anyone who knows me will tell you that. I moved to Montana because I thought the summers would be short and the winters long which is mostly true. But sometimes even a short summer is too long. The women are quilting. I do believe its the first time that they quilted in the summer. They will keep at it until they get the current quilt done. 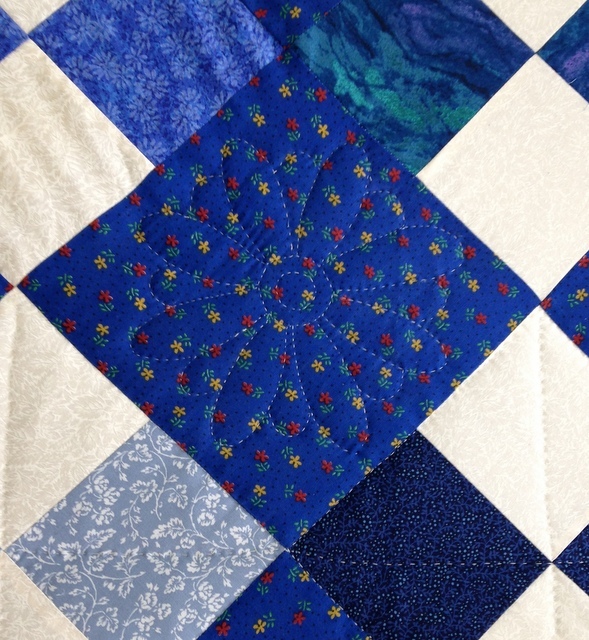 Its a lovely blue one that Cathryn pieced. We meet on Fridays at 10am but finish early afternoon before it gets too warm in the old school house. Before it gets too warm today though I wanted to mention some summer events that are actually happening at the Historical Village or to benefit the Village. On July 8, historian Hal Stearns from Missoula will give a talk at the Village beginning at 6:30pm. This event is co-sponsored by Humanities Montana and free to the public. Another free and awesome event is this year’s play put on by Shakespeare in the Park on August 25 starting at 6pm. The talented and energetic troupe will do “Cyrano de Bergerac” in the Historical Village. Box dinners by Cafe Jax will be available to help cover expenses to bring the troupe to Eureka. On August 8, the annual Historical Village fundraiser, “Dinner on the Lake” will be held. This is a wonderful way to spend an evening with friends having a gourmet dinner accompanied with live music on Dickey Lake – and support the maintenance of the Historical Village in Eureka. Space is limited to forty people so order your tickets soon. Call Lynda at 889-3492 for details.